Spin Cycle over at Sprite’s Keeper this week is all about Arts and Crafts…and I have done neither in the past few years that don’t involved washable paints or crayons. Oh, and there was the ribbon project I completed a couple of weeks ago…. This project all started when Lily asked her daddy why there were loops on the ends of her handlebars. Her bike is a hand-me-down from a neighbor, and the tassels that used to hang there no longer exist. So after Ed explained that there used to be ribbons hanging from the handlebars, we all piled into the car, and drove to Walmart to find new ribbons. The only bike tassels at Walmart came in a package along with a Barbie basket and bike bell. It cost around $8.00. Ed said he was thinking bike tassels would be more along the lines of two dollars, especially since if we bought Lily the Barbie basket package, we’d need to buy Emmy one too and would end up spending $16.00. If I had been by myself (what was I thinking when I typed that? By myself…hmm, interesting concept…) Anyway, if I had been with just Lily and Emmy, I probably would have bought the baskets. I’m a sucker for my little girls. Ed is too, but he’s a little more, well, economical than I am. So we traipsed on over the the gift wrap section, and bought a three pack of wrapping ribbon–pink, purple, and silver– for about two-fifty. “Now that’s what I’m talkin’ about!” says Ed. When we got home, I had to figure out how to attach the ribbons to the bikes. I looked in my craft box left over from my crafty days, and found some pink pipe cleaners. Perfect! I don’t know how long these will hold up, but the girls like the sparkle they add to their bikes. Emmy posing on her tricycle. She hasn’t figured out how to pedal yet, but she still loves her bike. Emmy’s trike–It’s been rainy and cold, so these haven’t had a chance to fall off yet! Lily is showing me how sparkly her ribbons are. 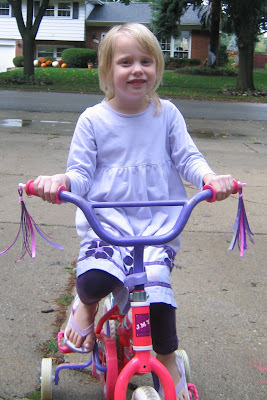 Lily on her bike–with ribbons! *Normally I am entirely against wearing flip-flops while riding a bicycle due to damage inflicted on my own toes when I rode my bike without shoes as a little kid, BUT we just came outside for a couple of minutes on a rainy afternoon, so Lily decided to wear shoes that COULD get wet, which just so happened to be her flip-flops, which she wore to the pool this summer. I just wanted to clear that up. **Oh, and Lily refused to wear her jacket since we were only going out to get the mail, originally, until I saw the bikes, and then saw the RIBBONS, and thought of SPIN CYCLE, so I ran to get my camera and we were outside longer than I thought we’d be! What a perfect solution! I love the faces… so happy to have new found ribbons! It's the little things.. Thanks for the disclaimer on the flip-flops – it did run through my mind. I pretty much came to the conclusion it was only a brief outing due to wet pavement and lack of coat. 🙂 Nerds Unite! Great job, great idea. I am sure I would have bought the whole set because I'm a sucker for that stuff too! 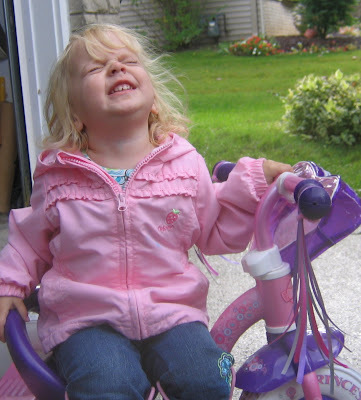 Emmy's face in her pose on the bike is not unlike my friend's involuntary reaction when a camera is in her presence. Cute kiddoes! And cute idea! What a great idea! Maybe that would get Sprite to play on her bike more. She doesn't like to ride it much, just push it around. She does need a better trike though. The one we bought second hand doesn't seem to get her interested. I have some ribbon, I think I have another project!